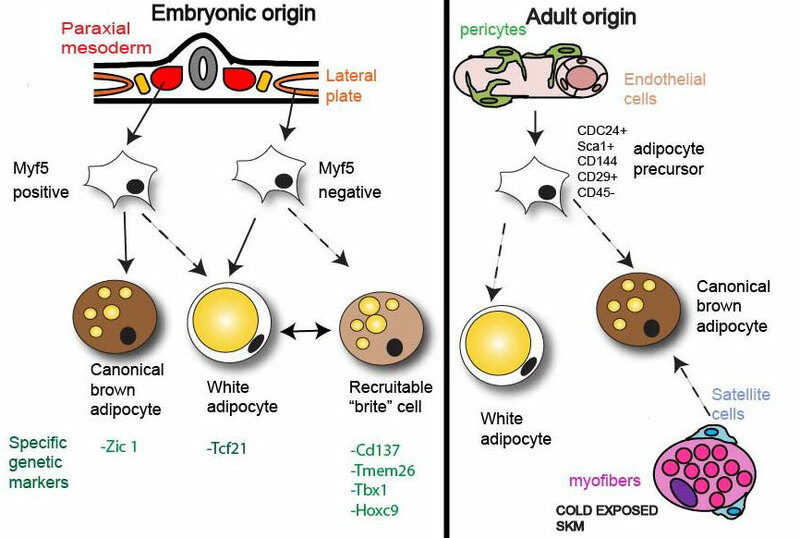 Overview of embryonic and adult origin of brown, brite and white adipocytes indicating the specific cellular genetic markers. Obesity is one of the most important biomedical problems in our society and also one of the most frustrating to tackle. For this reason, the recent identification of functional brown fat in adult humans has made the obesity research community very excited. Brown fat is a tissue that primarily consumes fat to produce heat that maintains core body temperature. As such, increasing thermogenesis using brown fat may be a safe strategy for preventing and/or reversing obesity and its associated complications. To be able to capitalise on the therapeutic potential of brown fat, it is fundamental to better understand the physiology of human brown fat as well as to identify the factors that control its development and activation. However, access to human cellular models is limited due to the scarcity of suitable biological material that can be obtained through biopsies. In the last few years, an increasing number of research groups have started to use human embryonic stem cells and induced pluripotent stem cells in their research. These cells can be differentiated into multiple different cell types, allowing researchers better access to human cellular models so that they can investigate their biology. In our programme of research we intend to take advantage of human stem cells to engineer brown fat cells, or adipocytes. We will use these cells as tools for genomic, genetic, metabolic and pharmacological screening to identify new molecules and drugs that can optimise the development and activation of brown adipose tissue. If successful, this strategy will open the way to new, safe therapeutic strategies to fight obesity and its associated metabolic complications. Stefania Carobbio is a postdoctoral research associate at the Wellcome Trust Sanger Institute. She works in Toni Vidal-Puig’s group, which investigates molecular mechanisms that control energy expenditure and brown fat activation.